This post was originally featured in Mediaplanet. Teachers deliver so much to our nation’s children — inspiration, motivation and, ultimately, their futures. Among the many ways teachers go the extra mile, they often spend their own money to ensure students have access to supplies and resources that will enable them to receive the best possible education. Develop a relationship with your child’s teacher and keep in touch with him or her often. Find out the best way and time to contact teachers and provide teachers with the best way to contact you. Supply information that will help your child’s teachers get to know him or her as an individual, such as allergies, behavior or learning issues, or changes in family life. Set learning goals with your child and his or her teacher, and foster the achievement of those goals. 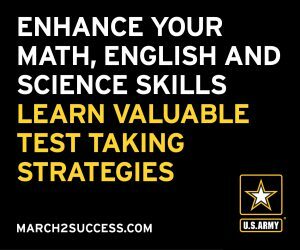 Review your child’s notes to ensure he or she is on track. Look in your child’s backpack every day and frequently view the parent portal for assignments, grades and important information from teachers and the school. Assist your children with his or her homework and talk about school matters at home. Actively participate at school when possible and volunteer in the classroom or at school events. 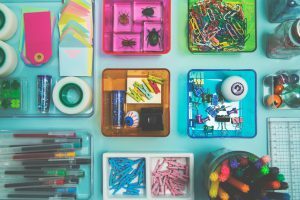 Contribute your talents and skills, and aid teachers with tasks that will assist them in the classroom, like cutting out materials for class projects or helping create pieces for bulletin boards. Donate school supplies — pencils, markers, paper, scissors, crayons, tissues, disinfecting wipes — to help make sure teachers and students have the resources they need for teaching and learning, and to keep classrooms healthy. Each year, the first full week of May marks Teacher Appreciation Week. This week is an important time to thank and celebrate teachers for their hard work and dedication to ensuring every child succeeds, but remember that every day is an opportunity to partner with and support teachers. Laura Bay is president of National Parent Teacher Association (National PTA), a nonprofit association dedicated to promoting children’s health, well-being and educational success through family and community involvement. In honor of Teacher Appreciation Week, we wanted to celebrate seven teachers who embody the GoFundMe spirit of helping people and spreading empathy. We’re always amazed and delighted to see the creative, inspiring ways educators use our platform, and we think you’ll be impressed, too. 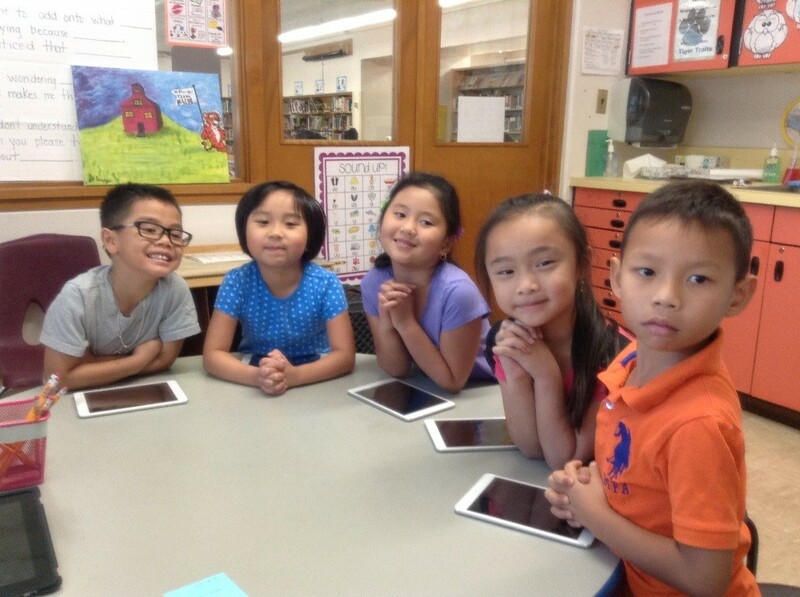 Mrs. Ellis teaches English as a Second Language in a low-income school in Denver, Colo. She recognized the huge impact having iPads in her classroom could have on her students’ progress in learning to read and write English. 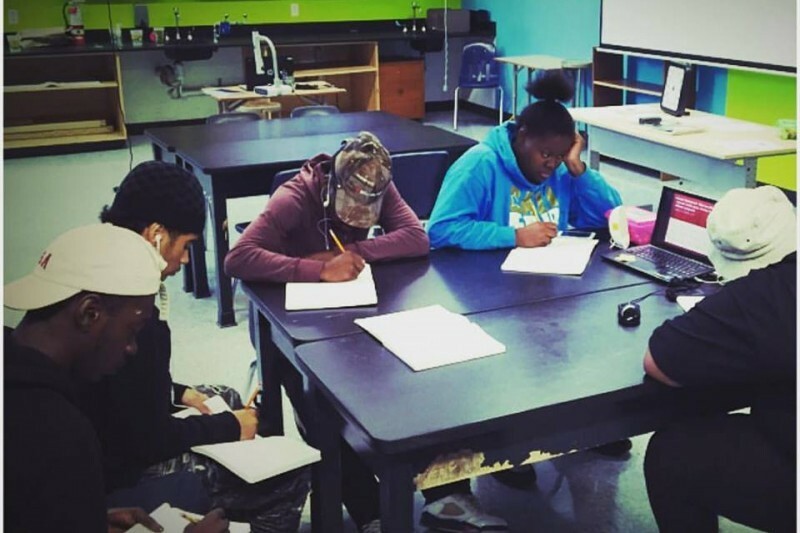 With no funding directly available, Mrs. Ellis turned to a GoFundMe campaign to equip her classroom with the latest technology. 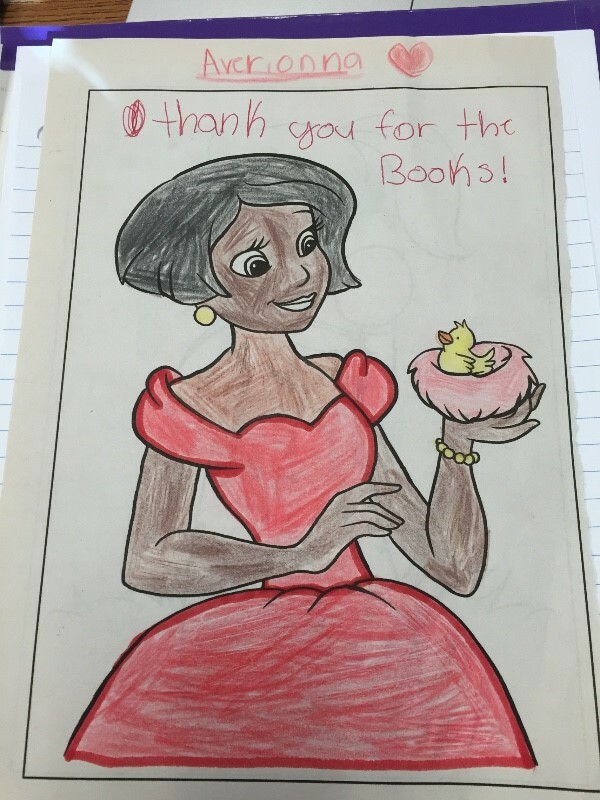 Stephanie Wilson’s students are ready to develop a lifetime love of reading. There’s just one hitch: it’s a challenge for these underprivileged kids to access the books they really want to read. That’s where this Champaign, Ill. teacher is taking charge: Stephanie has started a GoFundMe campaign to buy the books her students can’t wait to read, including Diary of a Wimpy Kid, Geronimo Stilton, and Captain Underpants. Stella Kim is a special education science teacher who wants to give her students something they rarely experience: a memorable field trip away from the classroom where they can learn, bond, and enjoy themselves. When Stella’s Oakland, Calif. school denied her request for the field trip because of lack of funds, she took matters into her own hands and started a GoFundMe campaign. In just 17 days, 39 donors raised $1,585—exceeding Stella’s goal. Now the field trip is booked, and these students have an exciting field trip to look forward to. The program lived up to its name: the collective GPA of Isaias’s students increased by 24%, truancy decreased by 15%, and they successfully ran the Seattle Rock & Roll half marathon. 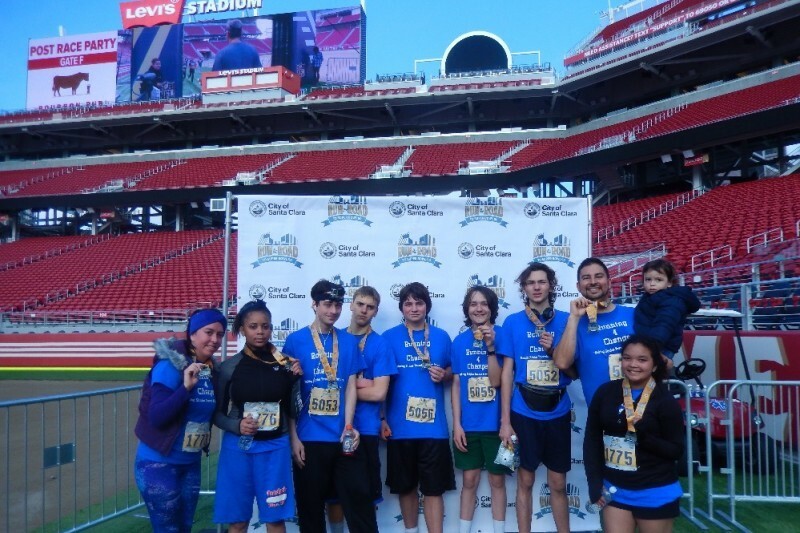 Now Isaias and his student runners are hoping to race in the San Diego Rock & Roll Marathon on June 5. They’ve raised over $2,000 so far and are hoping to hit their goal of $10,000. Sarah Gzesh wants take her students on an ambitious trip to fulfil her Hayward, Calif. school’s mission: to develop leadership skills in all students as they prepare for college. 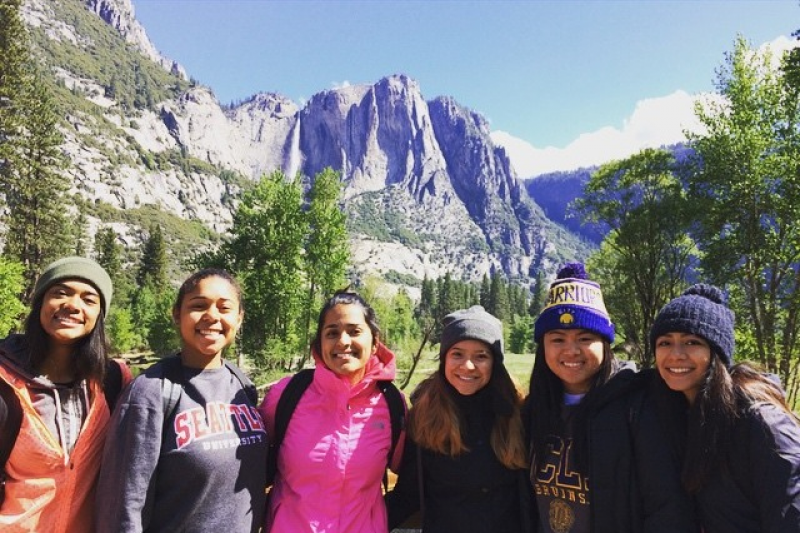 On a week-long trip to Yosemite, 40 high school juniors and seniors will learn to give back by volunteering at the national park and increase their appreciation of the natural world—all while taking a break from constantly checking their phones. In just 10 days, community members stepped up and fully funded this once-in-a-lifetime trip. 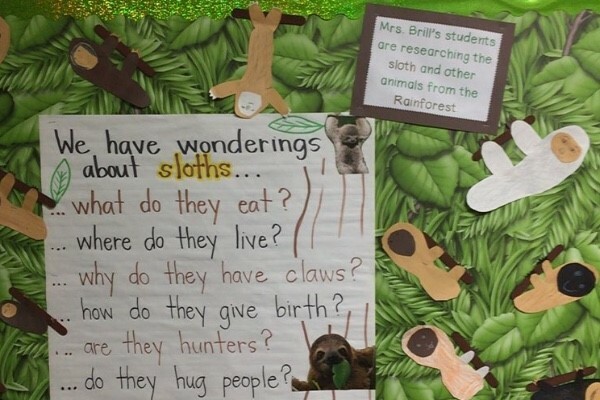 Lauren Brill and Jennifer Valenzuela spent a month teaching kindergartners and first graders about rainforest and African savanna animals, so it’s only natural they’d want to take the kids to the San Diego Zoo Safari Park to see some critters up close. The $15 entrance fee and travel costs, however, are out of reach for many of the students’ families, a large number of which are low-income. That’s why Lauren and Jennifer turned to GoFundMe. In just a month, they hit their goal, thanks to the generous donations of community members. We hope these lucky kids have a wild time at the zoo! 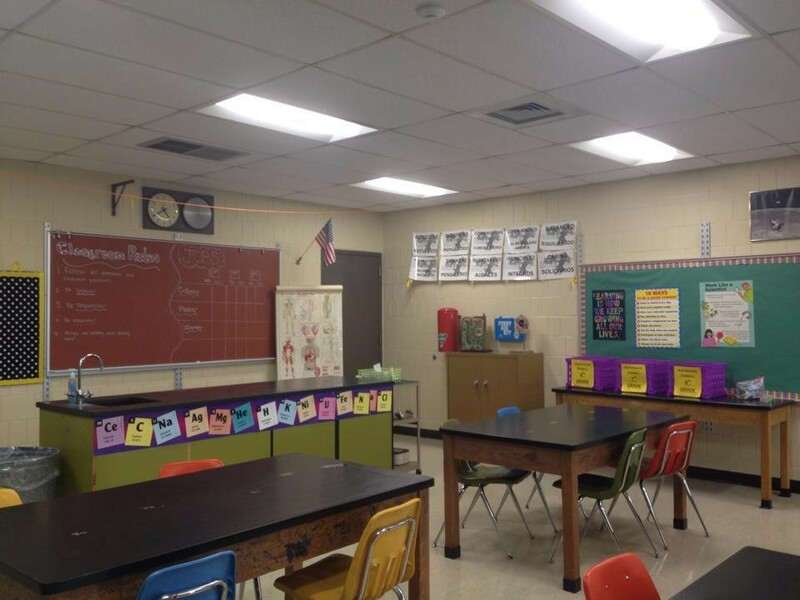 Stephanie Sample is working hard to make sure her classroom is place where students can be exposed to all the possibilities that learning science can offer. That’s why she wants her students to have a vibrant science library where they can explore topics at their leisure. 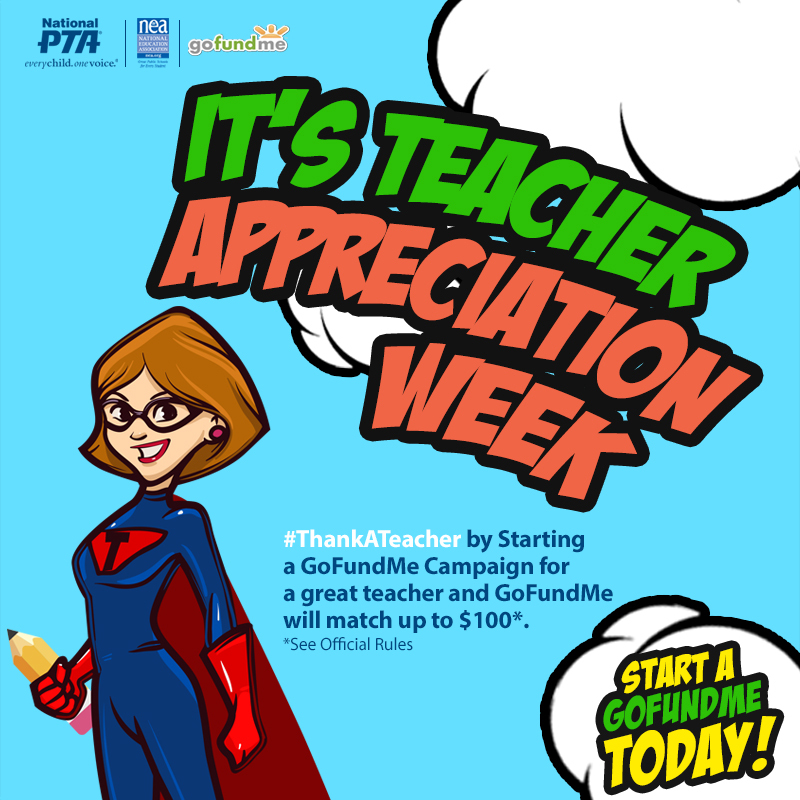 GoFundMe is a proud partner of PTA Teacher Appreciation Week 2016. Happy Teacher Appreciation Week 2016! National PTA Teacher Appreciation Week is one of my favorite weeks of the year. It’s a time to celebrate teachers—like myself—for their hard work, dedication and commitment to our children and their success. Every day teachers touch the lives of millions of children and change them for the better. They are real life superheroes. This year, we have joined forces with GoFundMe to give back to teachers and be a superhero for them. If you start a GoFundMe “Thank A Teacher” fundraising campaign by May 8, GoFundMe will make a matching donation of $100 to eligible campaigns that benefit teachers and students. Check out our sample social media graphics in our event toolkit and upload this Facebook cover photo. Download cards to #ThankATeacher and print these thank you certificates. Find out what teacher superhero power you have in our Facebook quiz and share it, too! On Thursday, upload a #TBT of you and a special teacher in your life and thank them using the official hashtag #ThankATeacher. Don’t miss a blog post about teacher appreciation and more on the One Voice blog and PTAOurChildren.org. Watch our #ThankATeacher videos on YouTube and create your own video message. With your help, this will be the best Teacher Appreciation Week! Enjoy this video with NEA’s President Lily Eskelsen García and myself. This week has been designated Teacher Appreciation Week, in honor of teachers and the important contributions they make to ensure every child succeeds in school and beyond. While our public education system has changed a lot over the years, two factors remain—teachers are essential to student growth and achievement, and it is vital that they have our support. 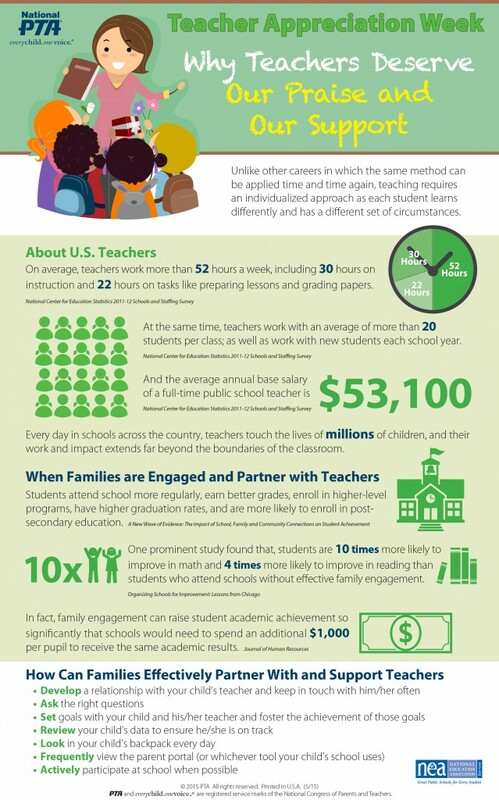 Check out the infographic below on teachers and the importance of family engagement in education and family-school partnerships. Don’t forget to visit PTA.org/ThankATeacher for additional resources. Heidi May Wilson is the media relations manager at National PTA. Here at PTA, we are very proud of our history, filled as it is with such accomplishments as the establishment of universal kindergarten, a juvenile justice system, and the National School Lunch Program. In 1912, we established February 17 as Founders Day to honor our founders, Alice McLellan Birney, Selena Sloan Butler, and Phoebe Apperson Hearst, and draw attention to our legacy of service. It seemed only natural to extend our celebration to the entire school community by establishing PTA Take Your Family to School Week during the week of Founders Day. Just as we honor our founders, for several years now, students, teachers, and school principals and staff have been welcoming families to school during this special week with family breakfasts and lunches, school assemblies, games, and many other creative activities to honor them. Parents have commented that PTA Take Your Family to School Week not only made them feel welcome to participate at school but also gave them the first real insight into how their children spend their days. For some family members, the event represents the very first time they ever walked through the school doors. As a longtime PTA member, leader, and now National President, I can’t imagine not “going to school” with my children, meeting their teachers not only during parent-teacher conferences, but also during the day when I can see and appreciate what they do, not only for my children, but for so many children. I always enjoy spending time with other parents and their children during PTA Your Family School Week, and feel this celebration is exactly what our founders might have envisioned. After all, the dream of establishing a national PTA was first imagined when Alice McLellan Birney sat drinking lemonade during a summer retreat in Western New York with some other mothers who were as concerned as she was about the state of education and child welfare in our nation. I wish all of our PTAs a happy Founders Day and a memorable PTA Take Your Family to School Week. Our sincere thanks to AXA Foundation, the philanthropic arm of AXA Equitable Life Insurance Company, for sponsoring this special week. If you are a parent who has never had a chance to participate in this event, what are you waiting for? We’d love to have you join us! My dad was a magician…. Well so I thought when I was younger. I would enter my class with a shiny, silver penny almost everyday. The kids would be in awe,wondering how I got a silver penny. Everyone knew pennies were copper of course. However, my answer was simple. “ It’s magic, my daddy made it.” My dad was not a magician, but a Middle School Science Teacher (He actually had to leave a PTA meeting because my mom went into labor with me). Anyway back to the magic….We (My brother, sister and I) went to school early with him everyday and I am sure he had to find some ways to entertain us before the school bell rang. So he would mix some “magic potions” and make smoke, fire and my beloved silver pennies. Looking back I truly appreciated my father being apart of my home and school life. Knowing he could pop up at any moment definitely altered my behavior at school. I saw him at lunch, recess and after school. To be honest, I didn’t always want him around but was secretly comforted that he was a door or two away. I also have a vivid memory of my childhood because of my father. Because of his passion for photography he made sure to capture every moment on film. Each of my siblings have at least 3 gigantic photo albums each, starting from day one that chronicles every play, sport, dance recital, cotillion and graduation we were apart of. Many people may not know what my father looked like because he was in a lab coat (magic cloak) or behind a lens. Flash forward to about 20 years later. My dad now retired but has played the same active role in my nephew’s life. His life is being captured on film and he sets up little science projects for him to discover. He even wants to be a magician. But it’s really not about the magic. The memories are about the time that was shared. My dad is the same as any other male figure who wants to be apart of a child’s life. Children want you to be present and active in their lives. That is why we are so excited about the Million Hours of Power Movement and what it can mean for so many children. It means the nurturing of the next great scientist, photographer and yes maybe even magician. You don’t have to be a male to help us in our plight for male involvement. Simply start with voting. Vote for PTA’s Million Hours of Power in the Pepsi Refresh project, then encourage everyone you know to vote for PTA. What Do You Consider As Justice? Recently a local prosecutor in Detroit Michigan made news by proposing a law that would have legal repercussions for parents who do not take part in such activities as parent teacher conferences. Now, I’ll admit that her proposal would probably be for those parents who are the worst offenders, but really? In California, a state Senate bill has recently passed a committee vote that lays out a series of punishments for the same lack of action by parents, in simple terms, not attending parent teacher conference and/or allowing their students to go un-supervised. These two suggested pieces of legislation has our media outlets buzzing and educational leaders wondering where did this all came from? And the question is valid, where is this coming from? PTA has long been an advocate for parent engagement. Parents, grand-parents, adult care givers should all be active participants in a child’s educational experience. These political recommendations should give us a great opportunity to both discuss options for getting adults engaged and why some elected officials find it necessary to impose legislation for parent involvement with a hammer versus identify more positive solutions. One example of a positive plan for parent engagement is the Parent Engagement in Education Act, HR5211. This legislation helps schools and school districts develop best practices for parent engagement, it’s that simple! When I was in school, Dad worked and Mom volunteered at my school. Today, both parents work and in many cases more than one job each. Many parents don’t have the time today that they had in years past, so PTA must work harder and longer to help encourage any caring adult to spend time in their local school. Although I do not agree with negatitive legislation that seems to force a parent’s involvement, the concern is real. PTA must work to see that our parents, elected officials and the public in general understand that there are more positive solutions to addressing these concerns.